Our all-new innovative training programs will teach you, your staff and colleagues how to effectively balance winter safety and environmental protection. When you apply what you learn at our training, you will have the skills to be more efficient with your salt along with the tools to reduce your liability and maintenance costs. 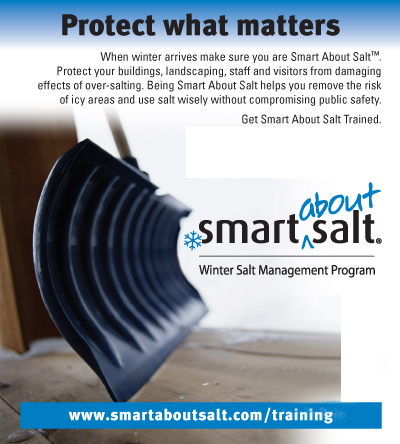 If you are an Owner/Operator, meaning you own or work for a winter contracting company, apply salt, plow or shovel snow around facilities then Register Here for our Smart About Salt Operator Training Program. If you are a Facility Manager, meaning you supervise contractors or staff who apply salt around your facility or you manage winter maintenance contracts for your property, then you want to Register Here for our Smart About Salt Council (SASC) Facility Manager Training Program. Please note that the Smart About Salt Council (SASC) maintains a separate Website for all online training courses accessible at sasc.lms.web.net.